Fr. Anthony Kavungal, former Vicar, founded a school at Mapranam in 1905 for Holy Cross Church Mapranam and named it Holy Cross L.P. School. 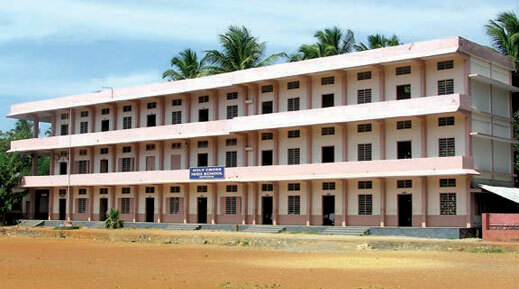 Then, the school was handed over to the government due to lack of funds to manage. Years later, Fr. Abraham Pulikel, former Vicar, received the school from the government on 19 May 1938 and got it transferred to Karuvannur Convent of Franciscan Clarist Congregation. They renamed it to St. Xavier’s L.P. School and managed it from 1 June 1938 onwards. The government aided educational Institution managed by Holy Cross Shrine, Mapranam and founded on 1984. In 2009, the school celebrated its SILVER JUBILEE. More than five hundred pupils are studying here with 20 teachers and 5 non-teaching staff are working here. Expect for one or two academic years, the school acquires 100 percentage pass and it is the BEST school in Porathissery Grama Panchyat, Irinjalakuda Diocese’s Corporate Educational Agency, Irinjalakuda Educational District and Thrissur Revenue District. The Vicar& Rector of Holy Cross Shrine is the Manager of Holy Cross High School.